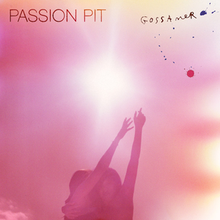 Gossamer is the second studio album by American indie pop band Passion Pit, released on July 20, 2012 by Columbia Records. Recorded in Los Angeles and New York City in 2011, the album was produced by Chris Zane, who also produced the band’s debut album Manners (2009), and lead singer Michael Angelakos. In an August 2010 interview with the NME, Angelakos stated that work had already begun on the follow-up to Manners, and that the band intended to release the album in the spring of 2011. “It’s gonna be a really fantastic, exciting, beautiful, gorgeous record. An absolutely beautiful record. I’m so excited”, he said. The album’s title was announced on April 24, 2012, along with its release date of July 23, 2012.